I’ve lived in Somerset for 18 years and have never been to Glastonbury. I’ve often wondered if, as a “local”, it is a right of passage to be there with the great and the good. But I don’t even watch it on telly and I definitely don’t want to be there when it is rainy and muddy! But friends go year after year, excitedly waiting at the end of a computer to buy expensive tickets to be together in a field. Why? What is it about music festivals? Is it the event itself, or is it being in the company of friends and family? Perhaps it was time to find out what the attraction is. After a hard morning’s work, we packed up the car and drove to Chagford, a small town on the north-east edge of Dartmoor, in Devon. Not terribly brave going to (technically) a 3 day festival when it is only 25 miles from home! The sun was shining and the forecast wasn’t too bad for the weekend., if you can believe that the Exeter-based Met Office can predict the weather in Devon! We “carbed up” in the local pub beer garden and drove onto the site. I’d brought a choice of two flags to put on the aerial to pick the car out in the parking lot. From the choice of “Ulster Rugby” or “Exeter Chiefs” flags, I thought the more local one would do down better. We unpacked the car over 3 or 4 trips. We hadn’t brought our own tent so how on earth did we need all of this stuff? Our pre-pitched tent was in a good spot and by that I mean not too close to the seasoned festival youngsters that were already well entrenched with their tents in circles, drink on the go and a mini marquee over the central “gathering place”! We got our wrist bands and a programme and went into the arena. The main stage and marquee tent were positioned quite close together with a ‘Live lounge’ tent over the other side of the site. 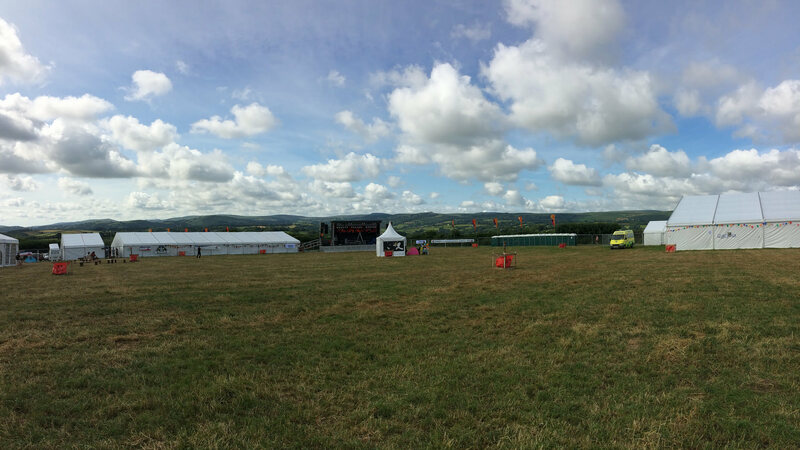 The main stage had the backdrop of Dartmoor. The set up – the main stage in the centre and the Marquee Stage on the right. There was a healthy spread of traders littered across the site selling all sorts of things that I’m guessing you would expect to find at festivals. What I wasn’t expecting to see was the chill out area – including massage and other complementary therapies – and a sofa!. The food area was more than impressive, ranging from organic burgers and hog roasts to the more exotic Thai style offerings with just about everything in-between – plenty for my vegetarian! The way that Chagstock run their stages is brilliant, whilst one act is performing, the next act are setting up on the other stage, this means that as soon as the band finishes, all you have to do is make your way over to the other stage and the next band are just about to start. The Marquee stage was jigging and we really enjoyed Mad Dog Mcrea! But really, Friday night was all about see New Model Army. We were warmed up nicely and managed to get fairly close to the front as surprisingly there weren’t too many people there. I don’t know what 5,000 people looks like as that is what the festival is limited too. But I don’t think that number was at the main stage to watch New Model Army. 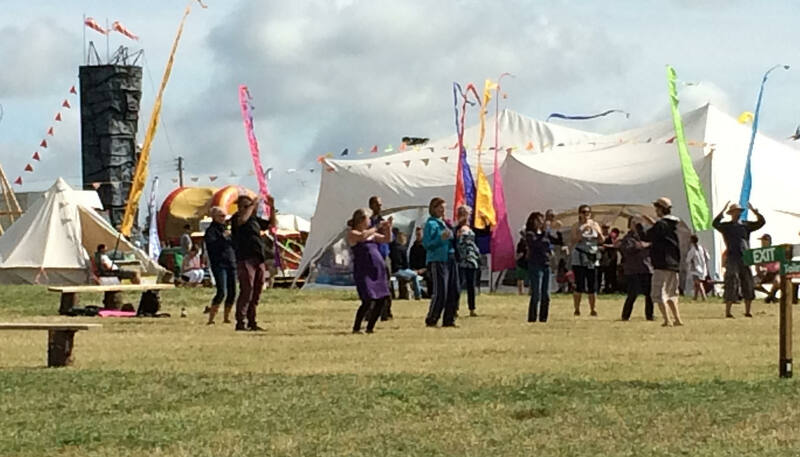 We walked the short distance back to the tent (really it was at the back of the main stage) and joined the revellers. When I say joined, we were beside them. We got into our sleeping bags, plugged in an ear plug and read, all the while listening to shrieks and laughter from the intoxicated youth!. When someone else pitches your tent, you aren’t in control of what is under the ground sheet. I would have, of course, checked for stones, trampled down tussocks of grass and gone for flatter ground than what we were on! I was somewhat smug that my hastily purchased self-inflating mattress (in the middle of my June microadventure) was going to cushion me more than the bravado of my sleeping partner! Some of those little buggers didn’t stop all night. They chatted, drank and listened to music. I didn’t hear it, but apparently there was a bit of a fight when someone tried to get into their tent, only to find a random stranger already in there! Let’s just say there was a lot of swearing and I was glad that I was asleep. Morning brought sunshine, freshly brewed coffee and the breakfast of champions! 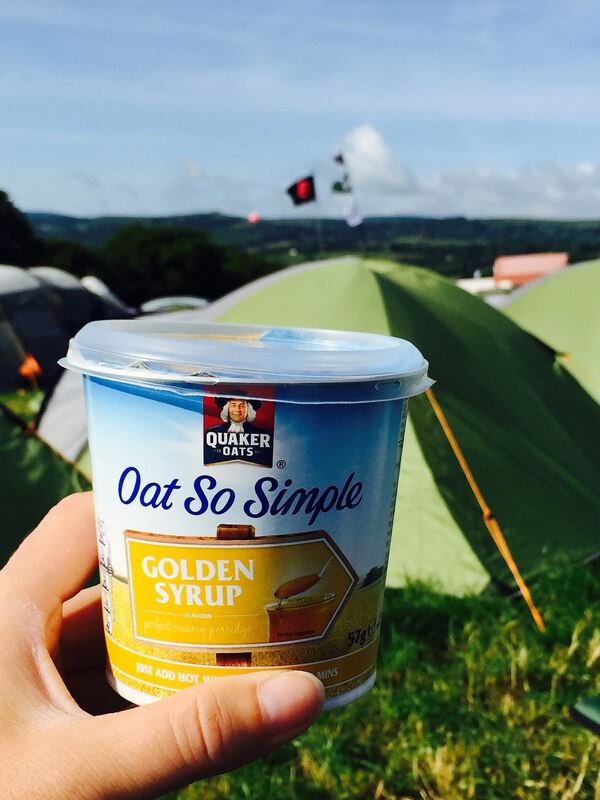 Golden Syrup flavoured porridge – the breakfast of champions! The kids didn’t look bleary-eyed enough for my liking. It took me nearly 15 minutes to be able to stand upright – unfolding tight and achy limbs while they stretched for another tinnie. But a little bit of Tai Chi in the “village square” would soon straighten that out. How festival am I??! One of the oddest experiences followed later that morning. I went to get some coffee from a mobile van. I recognised both the van and the two ladies who were manning it. It was the same van and ladies that I got my coffee from when I stopped at the Tavistock Food Festival during my June microadventure! I ordered the coffee and some cake. What are the odds that my two microadventures would cross in such a way, one month apart? 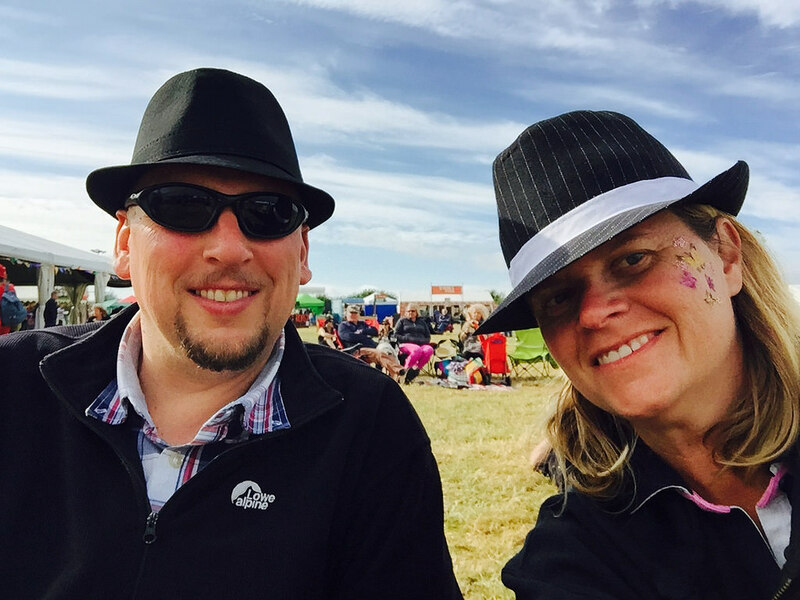 Next festival to do – face painting! The theme for the whole festival is Gangsters and Mols. I’m not really a fancy dress type of person so the most that I could bring myself to do was to buy a hat! The Gangster and his Mol! We ate different meals from the food arena that had everything you could possibly think of and sat it out to wait for The Levellers. Boy it got cold! This is July – it shouldn’t be this cold, even at altitude! Another festival goodie in the bag – a glow stick! Given to us randomly by some golden-oldies. It was much busier than Friday night and loads more of the Ganster outfits. It was fun, but not as much as Friday night. After the main stage was finished, we headed back to the tent via the “VIP” toilets in the main arena. I have to say they were great. Well maintained and certainly more posh than the ones at the campsite. One of the stages maintained the dance music for the after-hours party. Boy, that must have been some bass! I could feel it through the ground as I lay on my self-inflating mattress. My tent companion managed to negotiate a camp bed for the night and slept like a baby. Two ear plugs and some very tired youngsters made for a good night’s sleep. We didn’t have to vacate the site until noon, so I treated myself to a Reiki session at the chill out zone. Not really what I expected. I didn’t really expect to take from it what I wanted. I wanted to be told that there was a blockage in my energy and that it was all solved! I didn’t, however, buy the “festival pants” that I wanted. I was caught up in the moment but I think the majority of Exeter is happy about that. We found the car easily without the flag, rammed the gear in and headed for a fresh toilet and a warm shower at home. I have to say I was rather pleased to be so close to home and tiredness was starting to seep into my bones. Nothing an afternoon on the sofa wouldn’t cure.